What Surfboard Do You Ride In The UK? Each country has its own variable conditions with different coastlines…with the changing seasons thrown into the mix having the right type of surfboard can make the difference, between having a fun surf and a frustrating one. Can you really have a one-board quiver in the UK and surf 90% of the time? Now I surf mainly around North Cornwall all year round and picking just one surfboard for all conditions is not an easy choice. 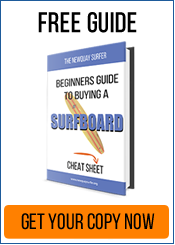 Your standard of surfing, weight and style inevitably come into play – but for the average surfer who likes shorter boards I do think it is possible to buy one surfboard that you can surf most days. If your thinking about a one board quiver, ponder on the typical surf conditions we get here in the UK. In North Cornwall the surf is usually waist high up to 1-2ft overhead and the spots are mainly beach-breaks. Maybe once every 3-4weeks those waves will go super-clean, hollow and offshore but that is rare. So a bit more width and volume in a shortboard will help with those junky onshore days and allow you to surf more often. So if you are not a pro who can bust airs on 5’11 blades but are of a reasonable standard – in that you can duck dive, surf down the line, do a few little turns and are happy to surf some overhead waves – then in my opinion you’d be wise to think about hybrid shortboards and fish surfboards. Now there are many boards that can fall into this criteria but if you consider a couple of factors such as volume and the ability to get out back and surf overhead waves you narrow things down a bit. I’d recommend making sure that a fish surfboard is small enough to be fast and that you can duck dive it easily on those overhead days – most fish surfboards I have tried over 6’4 are pretty difficult to duck dive in heavier surf. On the flipside make sure a shortboard is not too short so that you can still catch waves when the surf is small. As a rule of thumb go for more width on a shortboard if its under 6’2 or go for more length if its a narrower shortboard. Here are my suggestions from six manufacturers for surfboards that I believe should be good in 90% of the conditions we get in Cornwall for a surfer of average ability. * If you are under 10 1/2 stone in weight you can go a little smaller. If you weigh over 12 stone, then go a little bigger. Are there any surfboards that should definitely be on this list? Let me know in the comments box below! Simon Anderson Mollusc… I am 5’11” -13 stone and ride a 6’2″… It goes in anything from knee high Polzeath dribble to overhead Indo barrels… Excellent allrounder! You can have a one board quiver, however it’s good to mix it up. I think Luke Young shapes are good, i’ve got a 6’2 Zero for overhead days, its good with onshore, offshore and kneehigh waves as well. Got a couple of Quiver’s 5’10 Dirty Truck and 6’0 Bumblebart, both of which also go well in anything. Wouldn’t mind a board that isn’t from a local shaper for a change. Like a JS, Al Merrick; Fred Rubble, Neckbeard or DD or Firewire Hell Razor. Hmm Dunno? You make a fair point. However when I wrote this I wanted to talk about the common boards that were easily available for people to buy, and ones they would be bale to see or get hold of anywhere and relatively cheaply. So as the focus is aimed at mainly total beginners the focus is primarily on foamies and epoxy boards for the reason that they would likley get bashed about more and ridden into the sand. There are some exceptions but many of the local shapers tend to build fibre glass boards and many of the really tailored ones might be custom shaped boards. Don;t get me wrong though – I do think there are great shapers in Cornwall, and I am more than happy for folks to make suggestions! However if it was me, and I was a total beginner I’d stick to foamboards and epoxy ones at first for the reasons I mention. Hi I ride a 6″1 4th speed fish when not on my long board . Light and easy to duck dive very fast down the line and nice easy paddler. Really good for a progressive beginner and those who like to come off a long board once in a while . Next post: Surfers V Stand Up Paddle Boarders…Who’s Right? Previous post: ‘The Hunks’ TV show filming locations map in Newquay & people ask: ‘The Hunks’…are they gay?